The first Agile Israel meeting took place yesterday, and it was pretty darn good! Show-up: 32 people out of a 42 registered crowd. In the pictures you can see the room we had at SELA and Udi talking to the group. The first lecture was given by me and was about agile concepts. We didn't get very far before being bombarded with questions. I wasn't really sure if I wanted to just "let it ride" because the group is all about discussion. I don't think it went too well because I didn't get to finish the lecture. We intend to finish it in the next meeting. 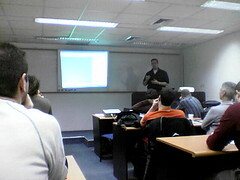 Next, Udi gave a lecture about using NHibernate for doing Agile Development. Here's the code from the lecture. All in all, I think we had a pretty good turn-up. I certainly met some unfamiliar faces, and it was good to see other people that already have a serious amount of experience with Agile under their belts. If you'd like to attend the next meeting and you have *not* already sent me an email, then send me one now to UserGroup at TeamAgile.com telling me you'd like to join. The first lecture is the "heaviest". the second two are smaller and simpler, thus making for a meeting that might touch all most of the attendees interests. You see, the point with Agile is that it spans many "cultures". We had people over fro at least three worlds I heard of - .NET, Java and PERL. Because it's so "broad" there's lots to talk about with lots of little concepts intertwined. Udi suggested this format and I think it might work. I did fear at first that we'll run out of topics very quick, but after some thought we figures the "Agile" topic is so broad and large, that would be practically impossible. I'm just thinking out loud here. In any case - we still have a ways to go before making this a little more cohesive group. But I feel like we're on the right track. See you next month! Also, would love to hear your comments on the meeting.